I have heard more from our members in the last few months since the merger has been announced than in all of the last 2 years I have served in this position. The topics have varied, but there are a few recurring subjects that I will try to summarize in the interest of sharing what is on our members minds. Several of our members are choosing to fund either a new or existing Donor Advised Fund (like Fidelity) with some of their low basis JCI stock while they still can, before the Inversion gets too far along. This is an effective way to meet your present and future years charitable intentions with a fully deductible contribution before there is a Capital Gains tax applied to your capital gains on those shares. Articles from other inversions warn that this needs to be done before the inversion process is too far along, or the IRS will raise objections which may affect the ability to use it as a charitable deduction. The exchange of your present JCI shares for either New JCI plc shares or cash has been further clarified in the SEC Form S-4 from TYCO. That publication says (pg 94) that the inversion process will use the $3.864 billion to convert 110,778,083 shares to cash. If the owners of precisely that number of shares do not select the cash option, the proration process will evenly adjust the choices of either those choosing the new for old shares, or the cash conversion, so that exactly that many share are in fact converted. So you may not get exactly what you request. There is a more mathematically detailed discussion of this proration process written by Jude Anders. You can find it on our website, WSJSociety.com at Connect/Front Page. I would suggest you review it, or have your Tax/Investment advisor do so, to be better informed on your available options. The merger with TYCO is targeting (but not guaranteed) to occur around the first of the fiscal year (Oct 2016) and the Adient spin-off shortly thereafter (end of Oct). A SEC Form 10 publication from Adient says (Pg 47-50) that shareholders of the new JCI plc will receive one share of Adient for every 10 shares of JCI they own. (plus cash for any partial share). The value of these shares received will probably be called a dividend and thus taxable as such (pg 162). Keep in mind that your New JCI plc shares and these Adient share will be quite new and thus any gains/losses you chose to realize on them would then likely be short term and taxed as normal income. In case you haven’t heard it clearly enough yet – It’s time to start talking to your Tax/investment advisor! Be informed on this issue. 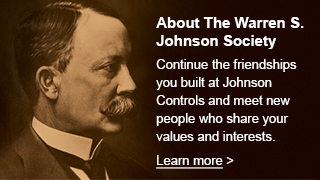 Read more on our WSJSociety.com/Connect/Front Page, as well as the Johnson Controls “Investors” section of JCI’s web site. I’m no tax or investment expert, nor do we have any inside information, but I’ll point you to what I’ve heard.